A few weeks ago, I published a blog post regarding nursing demand in Maryland—specifically, demand for registered nurses. At the time, I briefly introduced RESI’s new industry-to-occupation matrix and asked for suggestions for a name. Well, after at least a month of brainstorming (and voting! ), we have finally settled on RESI’s Predictive Regional Occupational Matrix, or PROM. 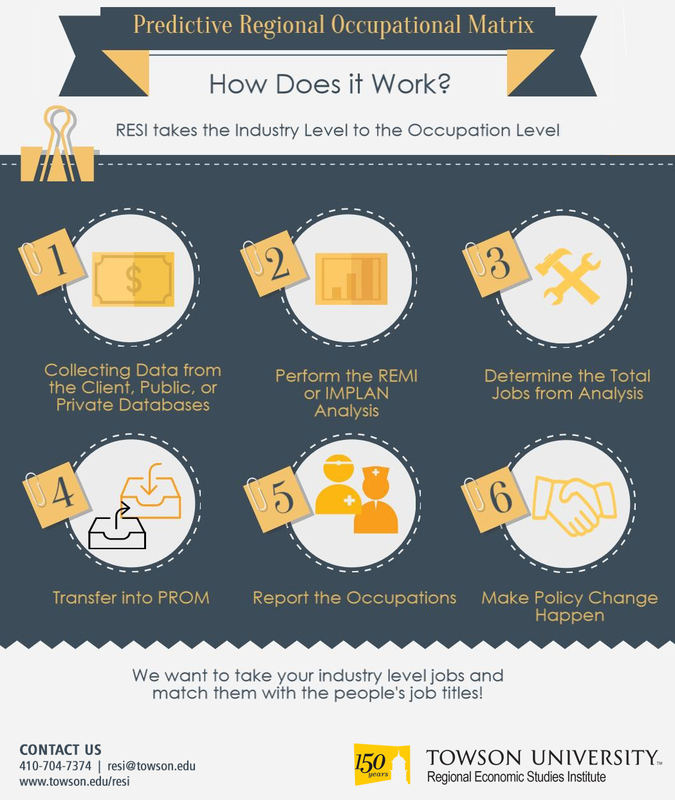 We’ll make this blog post RESI’s PROM-posal to you, and a more formal introduction of how PROM can be useful in analyzing the workforce needs of a region. Goodbye to the Old, Welcome the New! PROM is a tool that allows RESI to take forecasts for industry-level jobs and determine the specific occupations attributed to those jobs. 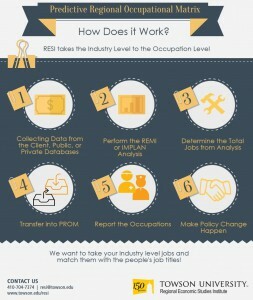 RESI has also developed a reverse interface to go from occupational data up to industry-level data. This reverse interface allows RESI to look at reintegration of occupations into a workforce. For example, I am currently using the tool to look at the impacts of minimum wage and mandatory sick leave policies, workforce demand/shortages, and targeted training. For several years, one of the biggest questions that I was asked when presenting job forecasts was, “What are the occupations that will be affected?” It is one thing to report that there will be 100 jobs in a sector, but relating that job count to specific people working in a field was a bit difficult. We knew the types of occupations associated with those fields when we used Occupational Employment Statistics (OES) data, but now we have a better way of answering occupation-related questions from clients and decision makers. 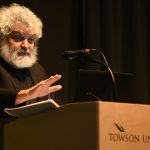 “A Tale of Two Policies” will look at the economic and fiscal impacts associated with the continuing change in Maryland’s minimum wage coupled with the possible passage of mandatory paid sick leave. Being able to look at the impact of both policies on Maryland’s economy and see the shifts in occupational data provided RESI with new insights—mainly in determining if there is overlap in occupations across similar industries. This finding may be helpful for workforce agencies attempting to target training offerings for future labor demands in their regions. RESI is proud to introduce the latest addition to our toolkit. If you are interested in learning more or seeing some work completed using PROM, please feel free to join us on October 9th for the joint REMI/RESI event, Raising the Bar on Policy. It’s a free event, but registration is highly encouraged. If you are attending the Economic Outlook Conference in November, please be sure to ask us about the tool and how we can help tailor the tool for your needs.